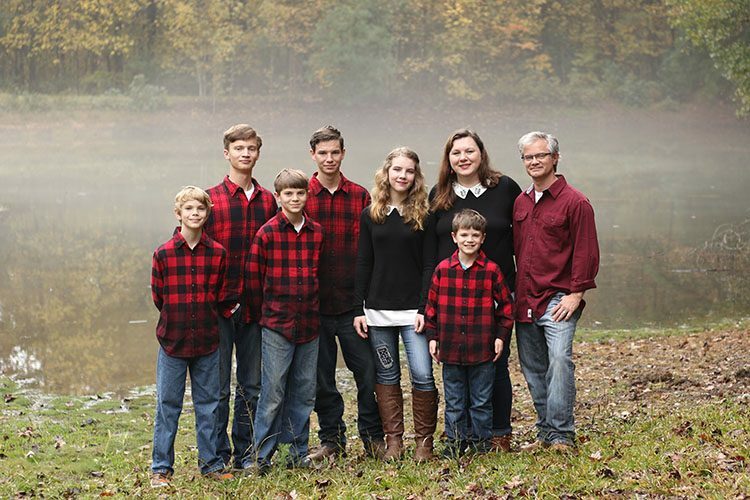 Do you love having family pictures? Do you like looking back at photos from your childhood or when your children were little. I do. I absolutely love it! 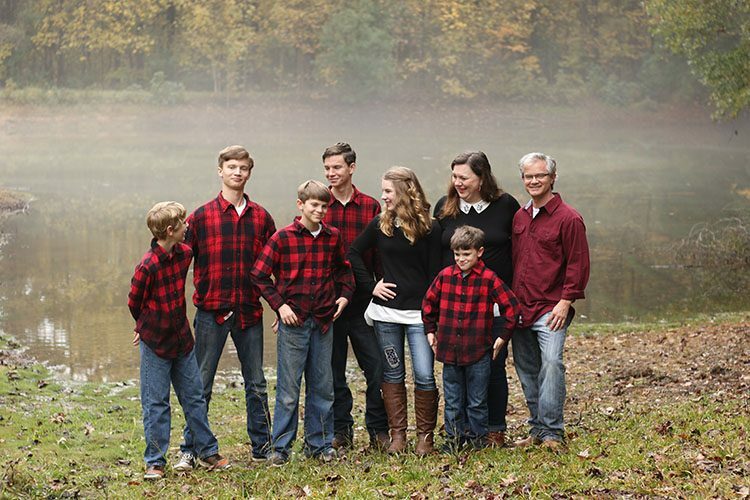 And today I’m sharing how this year we had Stress-free Family Christmas Photos. Saturday night my brother TJ called and asked me if I could do family pictures for them on Sunday. He works offshore and was about to leave for 3 weeks and they knew it would likely be too late to order Christmas cards when he got back home. Then Sunday morning while we were in church, it occurred to me that I should try to shoot our Christmas pictures too. The weather looked like it was going to be perfect (not too hot or cold, and overcast vs. harsh light or rain). The only hangup… I hadn’t given two seconds thought to what we’d wear or where we’d do the pictures and I had no time to shop and figure all that out. Usually I search Pinterest for hours trying to decide on a color scheme and poses and props, etc. Then I spend more hours either shopping in several stores or ordering all kinds of outfits online. But this weekend – there was no time for that. Of course, we could’ve worn clothes we already had, but I know me – I’d have been freaking out and panicking trying to coordinate outfits and hoping I could find things that were clean that didn’t totally clash. In a moment of desperation brilliance, I sent a text to my oldest son (who goes to church in a nearby, slightly bigger town) asking him to buy red and/or black shirts for the whole family on his way home from church. Walmart was pretty much the only viable option on such short notice and I didn’t even care. That meant I didn’t have to stress over it – I just wanted us to all have semi-matching, clean shirts 😂 He asked for sizes, then went shopping. When we all got home, I told everybody to put on blue jeans, shoes and their new shirt. Easy-peasy. I have to say – this might be my plan for all future family pictures. A quick trip to Walmart, semi-cheapy clothes and a mostly impromptu photo session without me worrying or flipping out or spending hours planning and shopping for the “perfect” clothes and setup. The whole thing was fairly easy, fun and there was no yelling, screaming, or crying involved. Okay – that’s not totally true. 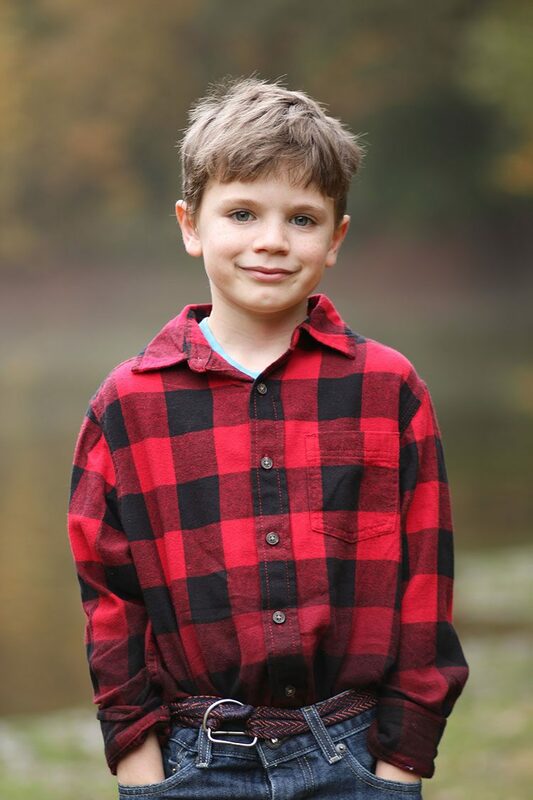 Asher (7 year old) wanted to wear his old red and black plaid shirt (which is almost too small), not his new one. He cried when Richy made him change into the one that actually fit. Thankfully, he recovered quickly and was very eager to pose for me. In fact, he volunteered to walk down to the pond with me before everybody else so I could check my camera settings and get an idea of backdrop before my brother and his family arrived. After I shot all of their pictures, my sister-in-law Amy offered to shoot ours. I had planned to do them with a tripod, timer and remote, but it was so much easier to have her do them. Hello… no running back and forth to the camera! 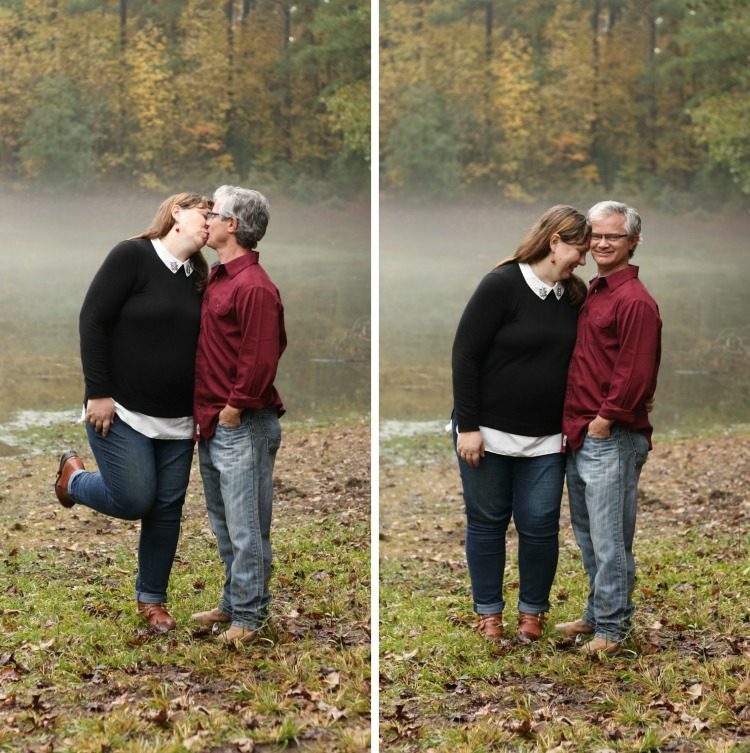 Anyway – I’m so, so happy that we got our pictures done! I hope to have our Christmas cards ordered before even publishing this. (note: my favorite places to order Christmas cards are Minted or Shutterfly). No, the outfits were probably not Pinterest-worthy, but they worked great! And there was no perfectly combed hair for us – or even belts that were put on right. I’m looking at you Asher… 🙄 what was happening there? But I decided it didn’t matter. What did matter was that we now have these pictures – these memories. And they turned out pretty darn good considering. Don’t overthink it. If you want to coordinate clothes, choose something simple and make quick decisions. If you don’t want to coordinate clothes, print your cards in black & white for a classic look. Choose a pretty background or have everybody line up on a brick wall. We’ve taken Christmas photos in a field, in our living room, in our front yard and even on a bed. Use what you have and go with it. Let good enough, be good enough. We didn’t take hundreds of pictures. My sis-in-law snapped maybe 20 pictures in a matter of 10 minutes. I took more of our kids individually, but we didn’t spend an hour out in the yard snapping endless pictures. She made sure all of the kids were looking and well-spaced… that was it. They weren’t perfect, but they were good enough. Don’t feel like you have to spend a forture. Yes, I have a nice camera and maybe more experience than the average mom, but you could seriously take your pictures with a cell phone if that’s all you have. I didn’t spend a lot of money on clothes, a photographer or even my cards. I used a coupon at Shutterfly on Cyber Monday and called it a day. 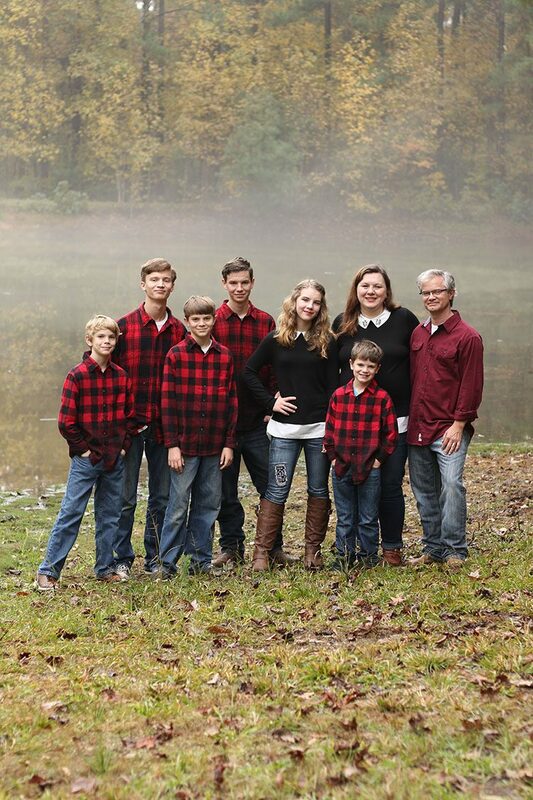 You guys – just take the family pictures. Everything aside, I’m not saying you have matching clothes or even send out Christmas cards. But take the time to take pictures with your family. Thanks so much Lisa – I’m so happy with them! A perfect setting for your lovely family. I love the mist in the background. Thank you Margie – the mist was an unexpected treat for sure! I love the way it looked in our pics! 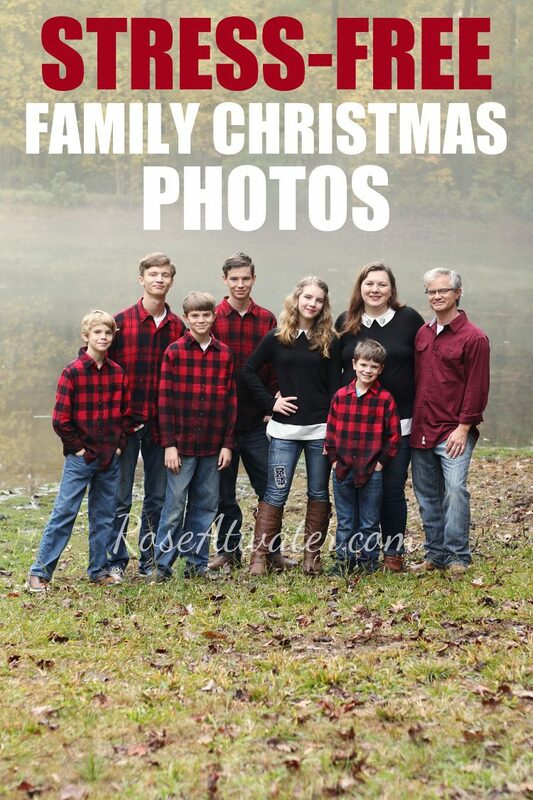 Wonderful natural family picture for Christmas cards! I think definitely Pinterest worthy. I am not a big fan of the posed and photo shopped pictures. Great memories in that picture.